Always open to cuisines from other cultures, we pulled a Peruvian crêpe recipe off the computer. Suffice it to say the crêpes did not come together as expected. With a slightly furrowed brow, we completed the recipe and placed the dulce de leche filled crêpes into our host's fridge during the dinner. Sadly, when we retrieved them everything had turned into a soupy glop. It was a disappointment that has been needling us ever since. Today, we're righting that wrong by creating a chocolate version of our favorite crêpe recipe to perfectly complement dulce de leche. Now here comes the good hack. Actually, it's an awesome hack. Traditional South American recipes for the creamy, caramel-tasting confection known as dulce de leche involve stirring milk and sugar in a pan for hours at a time. While that didn't actually deter us, murmurs of a simpler method were intriguing. Let's see if it fits into one sentence: Boil an unopened can of sweetened condensed milk in a pan of water for 2-3 hours to make dulce de leche. Seriously, that's it. Actually, it can be even easier if you own an Instant Pot. We don’t, but we hear that you can achieve the same results in 30-40 minutes. Let us know if you try it! When you open the can, this is what you get. The sweetened condensed milk that starts out white turns deeper hues of caramel depending on how long you cook it. (We cooked it for about 2-1/2 hours.) If you like a richer, darker flavor, cook it longer. We hesitated to photograph it in the can, because it vaguely reminded us of canned cranberry sauce at Thanksgiving. But it is so much better. And it doesn’t at all jiggle on a plate like can-shaped cranberry jelly. Although the basic instructions are a one-liner, please be sure to read the recipe below so that you don't skimp on practical kitchen safety measures. A dollop of unsweetened whipped cream (or even crème fraîche) is a nice balance to the sweet caramel-like filling and chocolaty crêpe. If you are making one can of dulce de leche, why not go ahead and make two or three at the same time? After opening the cans, transfer the contents to glass jars. Use one jar to swirl into ice cream on another day. And wrap the last jar with a bow, giving it as a gift to one really lucky friend. This recipe for dulce de leche requires having a simmering pot of water on the stove for 2-3 hours. Please take this into account so that you can plan on being nearby and to add more water if needed. Melt the remaining 1 tsp butter in a crêpe pan or nonstick skillet over medium-low heat. Pour about 3 Tbsp of batter into pan and quickly tilt the pan to form a thin, even coating of batter. Cook for about 45 seconds until the sides of the crêpe can be loosened with a heat-resistant spatula. Gently flip the crêpe over and cook for an additional 30 seconds. Slide the crêpe onto a plate. Repeat with remaining batter. It’s not necessary to add more butter before each crêpe as you’ve already seasoned the pan. 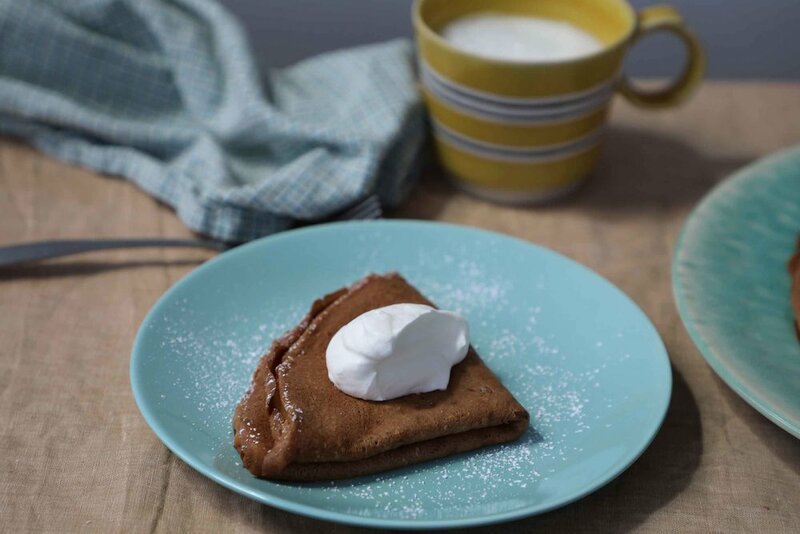 Allow crêpes to cool completely before spreading with dulce de leche. To make the dulce de leche, place the unopened can of sweetened condensed milk in a pot and cover it with water by two inches. Bring water to a boil, then lower heat and reduce to a simmer. Cover the pot and continue simmering for 2 hours, or up to 3 for a richer caramel flavor. Safety warning: Add water to the pot if it begins to evaporate below the level of the can. Allow the can (and water in the pot) to cool to room temperature before opening the can. To assemble crêpes, spread desired amount of dulce de leche on each one. Fold in quarters or roll and garnish, if desired. 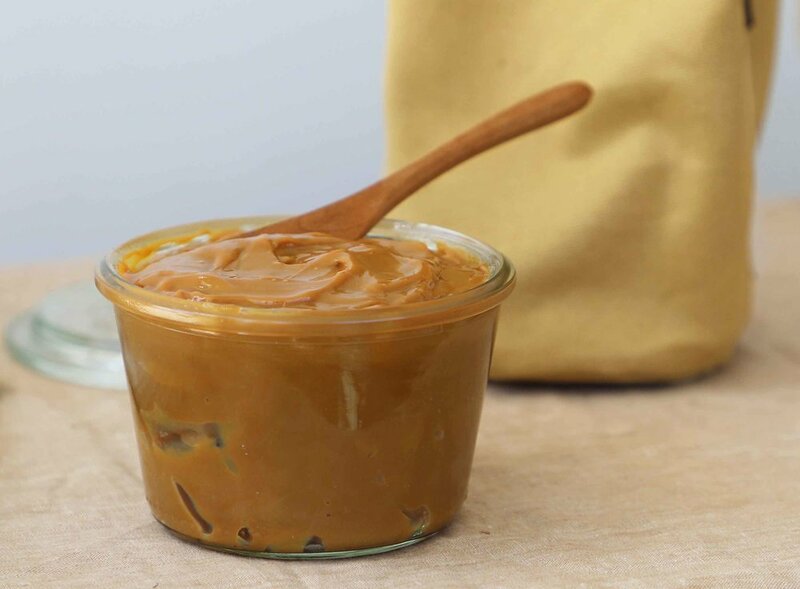 Transfer finished dulce de leche to a glass jar and store in the refrigerator for up to a month.